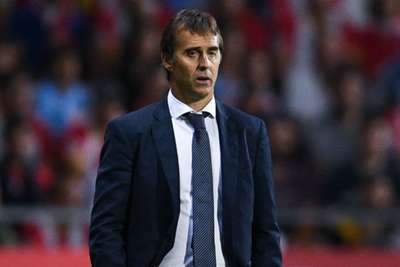 Julen Lopetegui insists Real Madrid cannot afford to dwell on their woeful run of form and is continuing to ignore speculation over his future as head coach. Madrid return to domestic action against Levante on Saturday after the international break looking to halt a run of four straight games in all competitions without a win, in which they have failed to score a goal. It is their worst drought in front of goal since 1985 and has already led to suggestions that Lopetegui, who was appointed as Zinedine Zidane's successor in June, is facing the axe at the Santiago Bernabeu. But Lopetegui has seen enough from his team to remain convinced Madrid can get out of their rut and is not planning on signing players as a solution. "No [we don't need to sign players], I think the solution is in every game. I'm completely confident in players and the squad we've got, I think we'll have a great season," he told a news conference. "There is a long way to go in everything, I think we're close to arriving at one of the peaks you have in the season, we'll be very strong very soon. "I think we'll have a great season and we're focused to face a complicated opponent who are in great form. We can't look back, we can only look forward." Asked if the players were anxious about their poor form in front of goal, Lopetegui replied: "We'll just try to do what we try to do and focus on our play. We're not worried about the record or anything, we just have to create chances and take them, that's the best way we can be in this game." Madrid's latest defeat, a late 1-0 reverse at Deportivo Alaves, saw the pressure crank up a notch on Lopetegui, who was forced to insist he did not fear for his job. And the former Spain boss does not believe focusing on aspects outside of his control will help the team. He said: "I'm not worried about what people are saying, I'm not taking much notice. We're worried about Levante and ourselves, like who's fit and who isn't - the rest is not in my control, so I try not to take too much notice. It doesn't help us win if I take notice of that." Lopetegui was asked if his plans had changed given Madrid's struggles and the 52-year-old said it is inevitable that a coach must adapt during the course of a season. "Plans change all the time, you have to keep evolving, keep changing things. You go into a season knowing what you've got and change when circumstances come along," he said. "I keep believing in what we're doing well and try to change certain aspects, but that's no different to any other team. "We're at a point where there are question marks over every team in every competition, nothing is decided and there is a long way to go."